WENATCHEE- Wenatchee Valley Humane Society (WVHS) hosted a low-income spay/neuter clinic for cats Saturday, October 21. 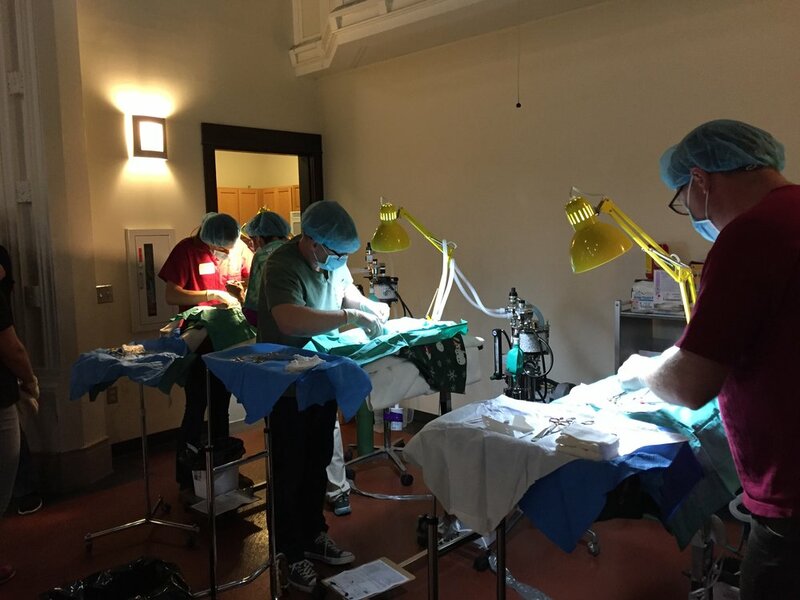 The clinic, sponsored by Community Cat Coalition and numerous community donors, served many families and stray cats in our area and set a clinic record of 106 cats altered. Unowned cats were ear-tipped – a process to show they are altered, vaccinated, and live in our community. The clinic, held quarterly, is open by appointment to low-income household in the Wenatchee Valley. Services provided include: spay/neuter, rabies and FVRCP (distemper) vaccines. Dr. Brad Crauer, Medical Director at WVHS, performed many surgeries and several local veterinarians volunteered surgery time, including: Dr. Harmeling, Dr. Miller, Dr. Warmenhoven, Dr. Eichler, and Dr. Womack (all of Cascade Veterinary Clinic) with assistance from Cheryl Stuart (Animal Hospital of Wenatchee) and Alison Womack. Also in attendance were Washington State University College of Veterinary Medicine students Tristan Troudt, Malkolm Graffe, Alison Herendeen, and Clinical Assistant Professor Dr. Matt Mickas. WVHS volunteer Dr. Kathy Archibald assisted, along with more than twenty diligent and hard-working WVHS volunteers. To date, these clinics have altered nearly 1,000 cats – both feral/community and domestic. WVHS is dedicated to keeping spay/neuter clinics in our community to assist getting cats in low-income households altered. Spay and neutering is the best way to keep cat populations from quickly turning from a few into thousands of unwanted cats within a few years. For more information on our low-income spay and neuter program, or to make a tax-deductible donation, contact the WVHS at (509) 662-9577 or visit online at wenatcheehumane.org.